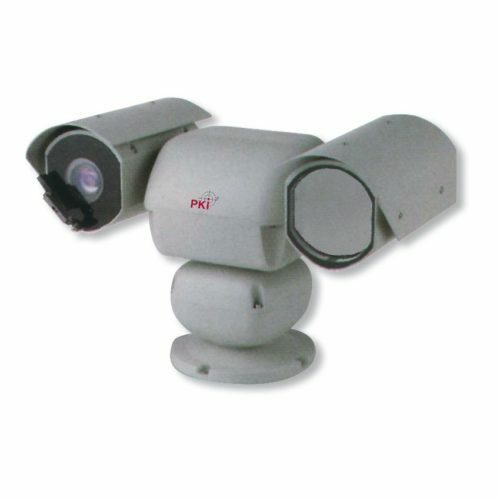 The PKI 5190 comprises a radar sensor in combination with a thermographic camera. The radar sensor is capable of detecting motion in areas of up to 800 m in radius with the coverage and sensitivity being precisely adjusted during installation. This means that also non-circular areas can be monitored and small objects such as animals can be faded out. Consequently, false alarms are prevented. The radar sensor can transmit the location of the movement. The automatic PTZ head control enables automatic recording of the activities. The thermographic camera offers great advantages in difficult lighting conditions or darkness. With the built-in zoom lens, each object under surveillance is zoomed in closely enough for identification. The PKI 5190 is computer-controlled, operates entirely autonomously and triggers an alarm in case of intrusion into the monitored area. Radar speed: 360° per sec.